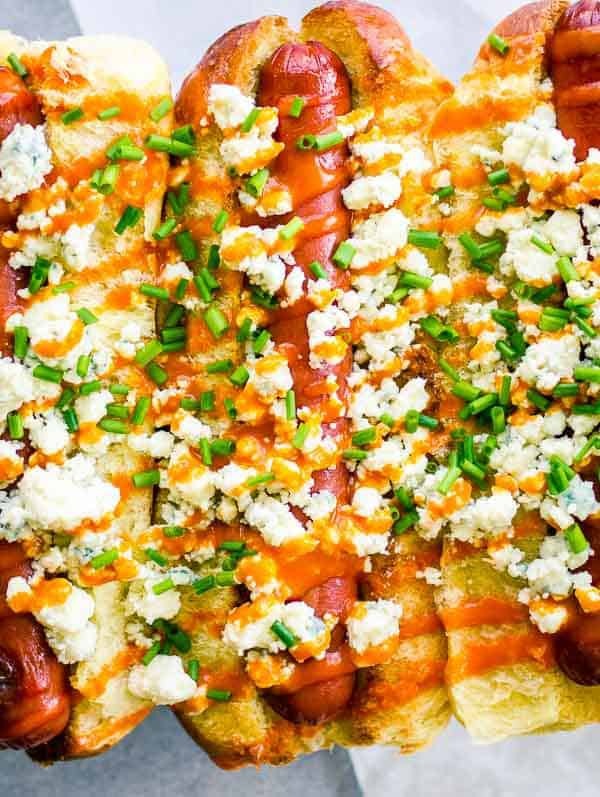 If you love the buffalo and blue cheese flavor combination, then you’ll adore these Buffalo Blue Cheese Frankfurters! I’m kicking off the second day of hot dog week with these addictive Buffalo & Blue Cheese Frankfurters! These babies are soooo good that I may or may not have eaten three of them myself. And probably could have downed a fourth had there been any left on the platter. I’m certain you know this already, but “frankfurter” is just another name for “hot dog”. I’ve always loved the word but you don’t hear it often in the US; we’re firmly in the hot dog camp. According to Wikipedia, “the word frankfurter comes from Frankfurt, Germany, where pork sausages similar to hot dogs originated”. 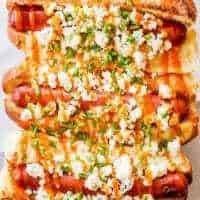 I decided that I wanted at least one of my hot dog recipes to have a more exciting name, so Buffalo & Blue Cheese Frankfurters it is. 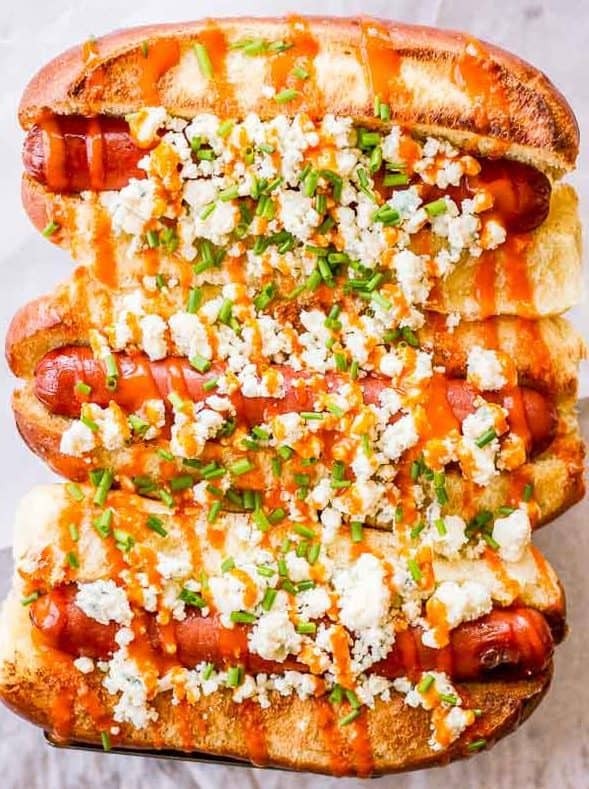 These frankfurters are simple: grill your dogs, toast your buns, top with blue cheese, a hefty drizzle of buffalo sauce and sprinkle with chopped chives. I make an entire platter at once; it’s messy but that’s the sign of a truly good hot dog, in my opinion. Whip up some of my Cheesy Mexican Gourmet Hot Dogs to add to the serving tray and you’ll be the most popular frankfurter lover in town! Amounts are simply suggestions; use as much or as little toppings as you like! Grill hot dogs and buns until dogs are nicely charred on the outside and buns are golden brown. (Butter the buns first, if desired). Top with crumbled blue cheese, buffalo wing sauce and chives.